--Sir Cumference and the First Round Table (A Math Adventure) (1997) Lady Di of Ameter and her son Radius help Sir Cumference figure out the most user-friendly shape for the table to seat his knights for their meetings. Great exploratory book for understanding shapes, angles and geometry. 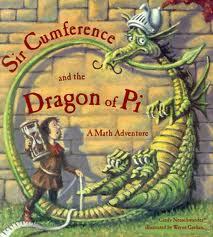 --Sir Cumference and the Dragon of Pi (A Math Adventure) (1999) It's Radius and Lady Di of Ameter off to the rescue again to save Sir Cumference who has been eaten by the Dragon of Pi. By visiting the cooks in the kitchen Radius learns how the Greek term Pi works in geometry and uses it to solve this math riddle. Use this one for Pi Day! --Sir Cumference and the Great Knight of Angleland (A Math Adventure) (2001) Radius goes off on a quest with Sir D'Grees to battle a Pair of Lells (dragons). In clever geometrical exploits, they teach math lesson plans on angles and measurement. --Sir Cumference and the Sword in the Cone (A Math Adventure) (2003) Again brave Radius, assisted by his friend Vertex learn about geometric solids and how to pull out the famous sword Edgecaliber from the cone. There are solid math lesson plans in this fun adventure. --Sir Cumference and the Isle of Immeter (A Math Adventure) (2006) Radius must help his cousin Per face down dragons and learn about geometry in a game called Inners and Edges, so that Per can rescue her kingdom and become Per of Immeter. Lady Di of Ameter and Sir Cumference lend a hand. --Sir Cumference and All the Kings Tens (A Math Adventure) (2009) Sir Cumference and his Lady Di of Ameter discover that when planning a birthday party for the King that using a base 10 counting system (or metric system) is the only way to count this growing crowd of guests. Here are some free printable math lesson plans based on Cindy Neuschwander books. Teacher Vision has free printable Sir Cumference math lesson plans for Pi Day. Check Education World for a complete unit of free printable Pi Day activities, geometry worksheets and math lesson plans from Sir Cumference geometry books. Then, head over to lesson plans for a bunch of free printable Sir Cumference geometry worksheets. Lesson Planet has many free printable geometry worksheetsthat are specific to Sir Cumference and the Dragon of Pi for Pi Day.